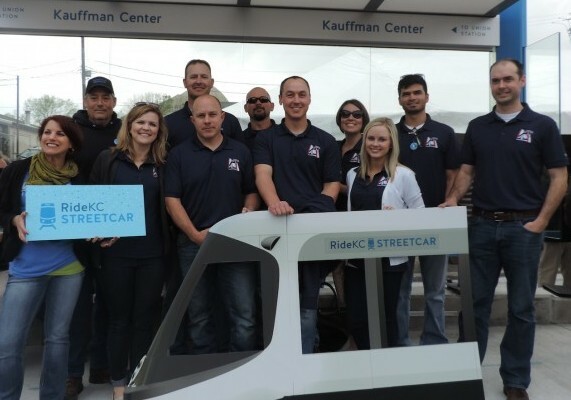 On Friday, April 24, 2015, more than 100 people came to celebrate the installation of the first KC Streetcar Stop located at 16th and Main streets. Special remarks were given by Mayor Sly James; Tom Gerend, Executive Director for the KC Streetcar Authority; Anton Kotar, owner of Anton’s Taproom & Restaurant; and Anita Uriarte, Manager of Nara’s Restaurant. The public was invited to a free outdoor celebration which offered food and drinks from Anton’s and Nara, and live music by Frankowski. Future streetcar riders enjoyed the opportunity to sit inside the first streetcar stop, explore the platform features, and snap “selfies” under the shelter. For photos of the event, visit the KC Streetcar Website Photo Gallery. The next station stop is already under construction at the northeast corner of 16th and Main. There will be a total of 16 KC Streetcar stops along Main Street once complete. All will provide ADA-compliant bi-level boarding, lighted displays, and protection from the elements. Thirteen of the stops will include interactive, digital kiosks as part of the City’s “Smart Cities” project, in partnership with Cisco.